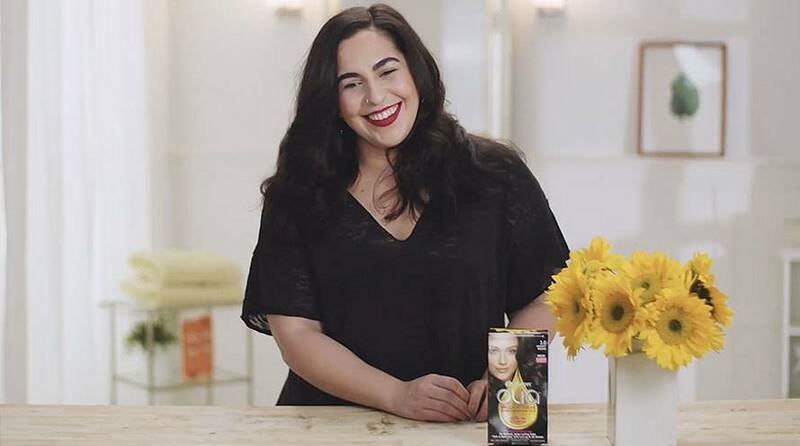 Garnier Olia shade 8.22, “Medium Rose Gold,” is a medium shade with delicate golden rose reflects. It provides up to 100% gray coverage. The color will be more vibrant on grays. 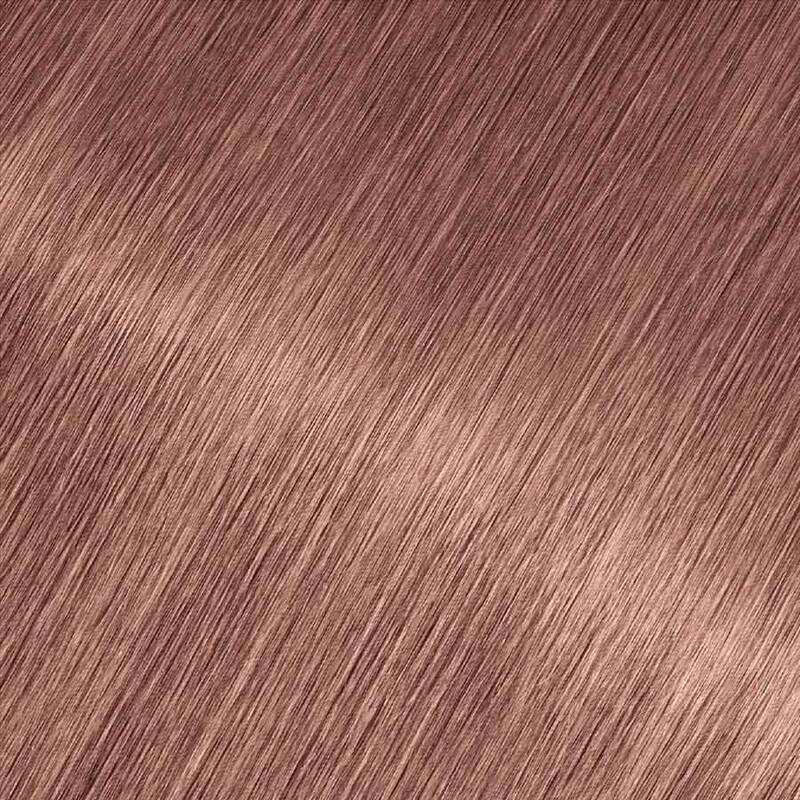 Shade 8.22 is best for anyone with natural, uncolored hair between Light Blonde and Light Brown. If you have darker hair, this shade is not recommended for you. For other rose shades, try shade 7.20 “Dark Rose Quartz” or “3.60 “Darkest Red Rose.” If you would like to remain in the light blonde range but would like to explore other reflects and tones, try shade 8.0, “Medium Blonde” for a natural reflect or 8 ½.03, “Medium Pearl Blonde” for multi-tonal reflects. *For women with currently color treated hair, there are special considerations for the color result you can achieve. This shade is not recommended for hair that has been colored Dark Blonde or darker, is bleached or is highlighted. For more help, use our Virtual Shade Selector Tool to find and try-on the perfect shade for you! Rated 1 out of 5 by LayLayMua from I was so excited for this color! I had received one free box to review, that wasn’t hardly enough so, I bought another with my own money. Nothing happened, I mean absolutely nothing. I wanted to give it a fair chance, so after 8 weeks, I bought 2 more (With my own money). Even with me pointing it out to people, the color wasn’t noticeable. I was really disappointed, I thought this color was going to be perfect. Rated 1 out of 5 by melipop_makeup from I was really excited to try this product but honestly was so disappointed in the outcome, barely making my blonde hair any different color and making my hair feel really dry. Wouldn't recommend it. Rated 5 out of 5 by BabyGurl from Great hair Smell good to be a hair color. Rated 1 out of 5 by BaseballMom1 from Disappointing results I hadn't dyed my hair in a while so I was excited to try the product. After following the directions I was disappointed because the color came out as an unnatural pinkish hue. Other rose dyes I have tried were really pretty but unfortunately it wasn't the case for the Olia Medium Rose Gold. I don't have any gray so I can't attest to how it would work for 100% gray coverage as the package claims. Rated 5 out of 5 by Shanshan2 from Beautiful Beautiful and unique color and when I dyed my hair the smell wasn't terrible like normal hair dyes it actually smells good. The box contained your typical at home permanent dye set of colorant, developer, and conditioner then your gloves and directions. The only difference is the conditioner doesn't come in the tubes they usually do and there's only 1.35 fl.oz. so that's less than the average 1.9 oz so I wasn't exactly thrilled about that but as long as it works just as good if not better than I guess that's no big deal. 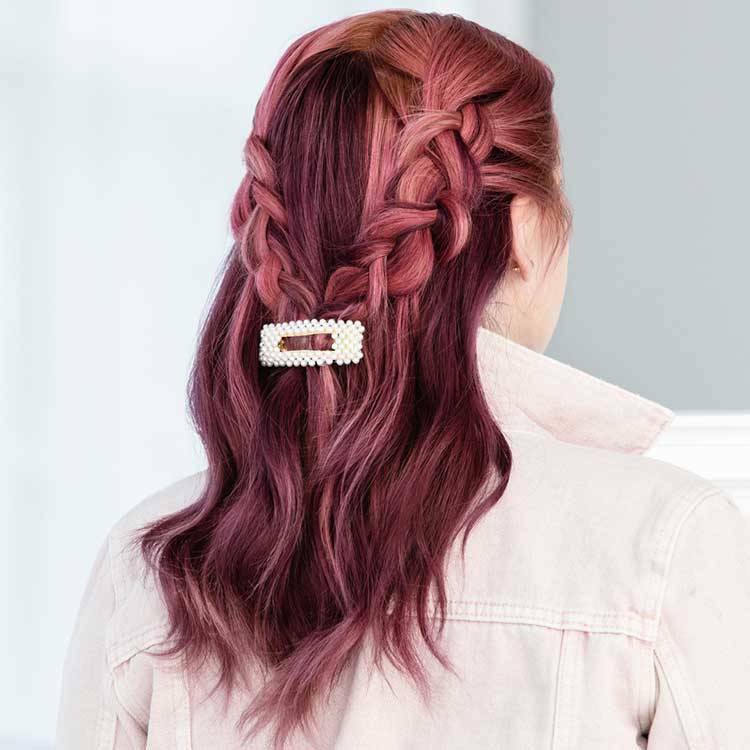 Rated 4 out of 5 by laniebugzlikes from Rose colored hair This color is truly beautiful! The rose highlights come thru so natural looking on blonde or grey hair. Not harsh and it doesn't smell too bad or strong. No burn and my hair feels super soft and healthy. 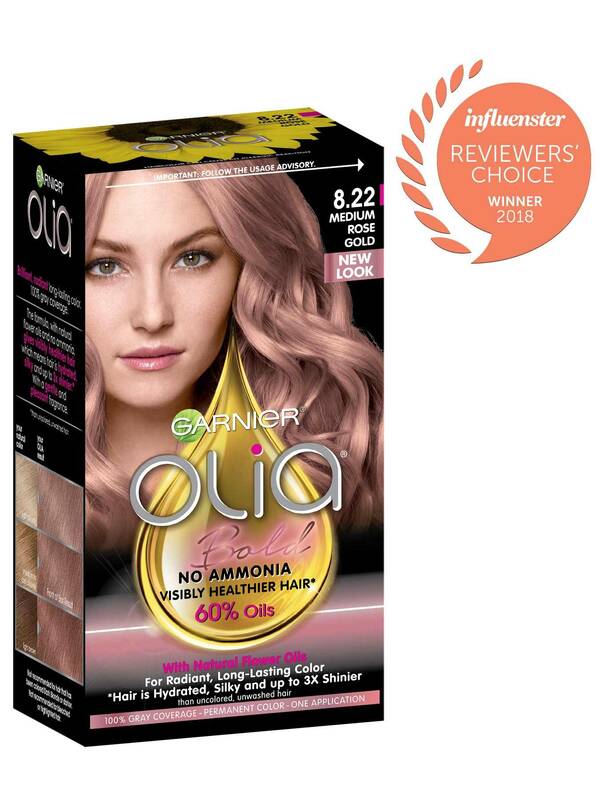 Rated 5 out of 5 by Jodibaby from Garnier Olia permenent hair dye in ROSE I absolutely love love love this color. Its subtle but beautiful. Easy to mix without makkg a huge mess ! And the application process was smooth and easy. Its git a wonderful rose aroma and smells far better than other box dyes.